Tricuspid Atresia | Adventures of a Funky Heart! If you are a fellow heart surgery Survivor, a Heart Parent, or just want to help rid the world of Congenital Heart Defects, feel free to link to Monday’s post. It will appear very late on the night of Sunday, October 24. The other day I discovered a Facebook based Heart Defect group engaged in a pointless mental exercise: They were listing celebrities that are connected to the CHD Community in some way that they feel should become a “Congenital Heart Defect representative”. Once that happened, “awareness” would be raised, money for research would come pouring in, and we’d all be saved. I’ve seen this happen before; the group concentrates its efforts on recruiting that one big megastar and ignores the people who are actually doing the job. Because true advocacy for an issue is difficult work. You don’t just stage a few events, look good for the camera, and recite the proper sound bites. It takes time, and the job is detail oriented grunt work. The i has to be dotted and the t crossed correctly and that is your job. Long hours, very little sleep, and the “pay” is a pittance, if anything. You do this because you believe. And by the way – if all you are doing is “raising awareness”, then you are not helping. That young mother doesn’t know Heart Defects is the most common birth defect… and she doesn’t care. What she does know is that her child is very sick and the doctors are throwing words at her she doesn’t understand. She wants someone who can explain this to her in simple English and give her some hint of the future. And even if the future is dire, she wants to talk to someone who will tell her the truth, and gently let her know that sometimes its OK to say goodbye. I’m honored to know people like this and count them as friends; I’ve also shared some of their stories on Funky Heart! over the past two years. You probably haven’t heard of these people anywhere else. They don’t mind; because they aren’t seeking personal glory. The most “famous” Heart Warrior I know might be Heather, a CHDer who saw an ad in a magazine for a TV show seeking women with heart disease. From the wording of the ad Heather realized they were looking for people with Acquired Heart Disease and ignoring CHDers. Heather got in contact with the show producers and gave them a piece of her mind – and as a result, appeared on the TV show How to Look Good Naked! Karen T. Chavez and Kim Rooks serve as Co-Directors of the Broken Hearts of the Big Bend. Heart Defect Awareness isn’t always the answer, there are times when what is needed is Education and Support. If you have a Cardiac Kid in the Tallahassee (Florida) area, Broken Hearts members can walk you through what may come next – and be right there with you, lending a helping hand when you need it. Why? Because we’ve all been there. Colorado’s Amanda Adams has a Cardiac Kid; when he was born she could find very little information about his defect and almost no support. Frustrated, she decided that no mother should ever be in such a situation… and began the support group Hypoplastic Right Hearts. A former teacher, Amy Verstappen‘s health deteriorated after the birth of her daughter. Unfortunately she had some doctors we were not familiar with Congenital Heart Defects in Adults and they almost sent Amy for a heart transplant! Thankfully Amy found Cardiologist Dr. Carol Warnes. Dr. Warnes saw the X-ray, knew what she was looking at, and got Amy what she really needed – a valve replacement. After the surgery this same Cardiologist challenged Amy to do something about the adults with CHD who were not getting good care. Her journey has taken Amy out of the classroom to serve as President of the Adult Congenital Heart Association. And not to be forgotten is the late Jim Wong, a PhD who lived and worked on the West Coast. Jim’s training was in Chemistry, but when it came to learning about heart defects he just wanted to know as much as possible… and he never hesitated to share what he had learned. He often traveled to Washington to serve on a patient advisory committee for the National Institutes of Health, and was at every ACHA event I attended until he was too ill to attend. Fifty-four years old, Jim was one of the older CHD survivors, and grew up in the days when CHDers were X-rayed, scanned, and fluoroscoped as much as possible. A lot of older survivors pass away after a bout with cancer, not because of their heart. There is currently no medical evidence to prove this, but one theory contends that absorbing all that radiation while they were young leaves older Heart Warriors more susceptible to cancer. Jim Wong died of cancer earlier this year, perhaps as a result of all those x-rays. I like to think he died the way he lived – helping others learn about defective hearts. TELL HIM WHAT HE’S WON! During my appointment in Atlanta I mentioned a problem to my doc – my legs have been hurting. I didn’t think it really amounted to anything…. I fell on July 22, and had not been on my walking program for fifteen days. I couldn’t: my knees were so badly bruised that I didn’t walk, I waddled. Imagine a penguin, that is what I looked like. So when the bruises began to heal and my legs felt better, I started walking again. Short distances at first, because after a big layoff my body tend to “reset” and I have to build it back up. So I walked a short distance and I felt good. The same for the next day. The third day I felt really good and just kept going. I walked over a mile! But the day after that my legs were killing me! Well that wasn’t smart, I thought. Too much too soon. But my legs hurt every day – didn’t seem to be getting better at all. I had the fleeting thought that maybe hitting the floor had damaged something worse than bruises, but my main concern was that perhaps my Congestive Heart Failure was worse. Did my ankles look swelled? Yes they do!… no they don’t….. maybe. (I’m not really paranoid but my mind can run away with me occasionally…. can you tell?) So yes, if my legs weren’t feeling better, we’d certainly be talking to the Cardiologist about this! So I went by the lab before I left and we came home. Friday afternoon I got a telephone call from the doctor’s office…. I have high levels of Uric Acid in my blood, which means a possible case of the Gout! So tell him what he’s won! You, sir, have won a prescription of Allopurinol! *Sigh* Another drug…. and a few more dietary restrictions. No seafood, for example, but that’s not a big deal because seafood isn’t on the Heart Failure diet either. So I have to give up something I gave up eight years ago! Also, no cooked liver. That’s not a problem, I am not a liver lover! Gotta watch the fried foods, that might be a bit of a problem but I will figure it out. And most importantly, we’ve figured out why my legs have been hurting! I was very pleased – to say the least! – about my exam at the Emory Adult Congenital Heart Center yesterday. An Echocardiogram showed that my Left Ventricle is 6 Millimeters smaller than the original Echo done there in 2002. It was 82 Millimeters across in 2002; it is now 76. And in my case, a shrinking heart is a 100% Official Certified GOOD THING! If there is trouble in the future, if my PulseOx numbers were to start dropping and I was feeling worn out all the time, there are a few options that we could try to help get me back on an even keel. A couple of them are invasive but do not involve heart surgery… surgery can be a risky (and quite possibly fatal) proposition for me. First things first, remember that 1) I am not a doctor; I’m just trying to explain it to you as it was explained to me. 2) This applies only to my heart and my health situation. Every heart defect is different, and what works for me may not be such a good thing for you… and vice versa. The general plan for me would be to increase the blood oxygenation… but when you do that, the heart is naturally going to work harder. The trick is to find a happy balance between a decently high PulseOx and the amount of work that the heart can do. Right now my PulseOx is in the low 80% range and I have that happy balance. The Bi-directional Glenn Shunt, the operation usually performed today: The Superior Vena Cava is cut where it joins the heart and is sewn into the Pulmonary Artery. They usually try to sew it as close to the T formed by the Pulmonary Artery to deliver an equal amount of blood to both lungs. The Classic Glenn Shunt, performed on me in 1967: The Superior Vena Cava stays where it is. Instead of being cut, it is sewn closed. The right branch of the Pulmonary Artery is cut and sewn into the side of the Superior Vena Cava, which means that all of the blood from the Superior Vena Cava is sent into the right lung. Now in my case, the Vena Cava wasn’t sewn completely closed. I don’t know if that was an error or if a small opening was left to relieve pressure that got too high, but a small amount of blood gets through the chokepoint and into the Right Atrium. If I were to start having problems they could use a Catheter to plug that small hole. That would cause my PulseOx to climb but shouldn’t increase the heart’s workload too much, and would probably be my best option. The second thing they could do would be to create a fistula in my right arm. Basically, they would “short-circuit” the circulatory system by connecting an artery directly to a vein. My blood would head down my right arm as usual, but would “turn around” and head back toward the heart before it normally would. (Don’t worry,there are lots of of arterial branches and veins…. my arm wouldn’t rot and fall off!) That would increase the PulseOx numbers… but would also increase the heart’s work load. It is probably my second best option. The third option would be a combination of medications that could reduce the natural resistance inside my body. Part of the heart’s work comes from how far the blood travels – if you could take all of the blood vessels out of an average human child and place them end to end, you’d have about 60,000 miles of blood vessels! Part of the heart’s work is because of resistance – your blood also has to turn corners and flow through organs (“Scuse me! Comin’ through!”). The medication would “grease” my blood vessels and make the blood flow through them easier. This would cause my PulseOx to rise… but not as much as any other option. My heart would also work harder. With more effort but not as many benefits, this is my third and least attractive option. But getting a good report now gives me something better than all three of these possibilities: time. Nothing has to be done now, nor for the foreseeable future. And if I do reach the point where something needs to be done, delaying it now means that another option could be developed that might be even better than the three ideas currently on the table. All part of the master plan to keep pushing that final day back! UPDATE: See Heather’s comment below for a good laugh! 🙂 Thanks, Heather! I’m in town for a scheduled checkup with my Cardiologist – tomorrow morning at the Adult Congenital Cardiology Clinic at Emory University Hospital. I’ve got to get on the right page – they’ve recently started calling the Clinic the EACH Center (Emory Adult Congenital Heart). That’s ok with me… they could call it the Greater Atlanta Earthworm Racing League if they wanted, they’re still number one in my book. This is a routine appointment, scheduled months ago, but I have a feeling it could be a bit more detailed than usual…. it was planned before my fall. So I’m betting that I’ll be scrutinized a little closer than I normally would. That’s fine, and will really set my mind at ease. I really can’t say enough about the Emory team – they keep me going. Not long after I was released from the Emergency Department in Houston and returned to my hotel room, I sent an e-mail to my Cardiologist and the unit Nurse Practitioner telling them what had happened. Within a few hours I received an e-mail back from both of them. My doctor was pleased at the level of care I had described, and told me to keep him informed. The NP had a question: Had I really tripped? Was it possible that I had blacked out? That could signal a larger problem. Nope…. I tripped. I didn’t just hit the bag and go down, I lost balance and did a stutter-step or two before falling, so there was no question about that. 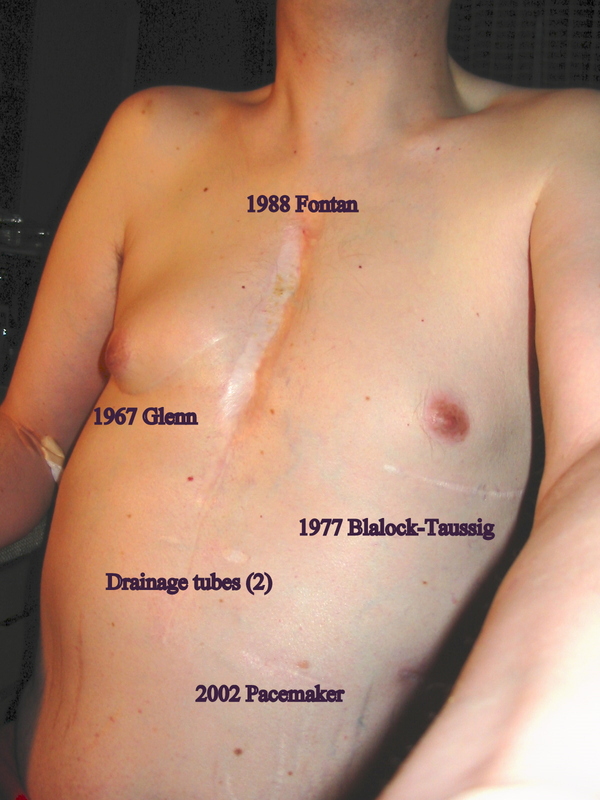 I had fallen flat on my chest, too – right on my pacemaker. My cell phone was broken in the fall, could the pacer have been damaged, also? It’s certainly a lot more important to me than a cell phone! I called the pacer lab and they checked my pacemaker over the telephone right then…. and called with the results two hours later. It was fine, and my leads were functional, too. So not only are they good, they can be fast when you need them! Jill and Shane continue to report on Joshua. Diagnosed prenatally with Hypoplastic Left Heart Syndrome (HLHS), Joshua was delivered at a major medical center and was immediately sent to a Neonatal Intensive Care Unit. By contrast, I was born in a community hospital of less than 100 beds. My grandfather – only an occasional smoker – was so nervous that when I didn’t show up on time, he unwrapped the celebratory box of cigars that he planned to give away and lit up. He was chased outside (smoking was accepted almost everywhere in the mid 1960’s, but a nurse wasn’t comfortable with anyone smoking around the newborns) so he stood under a dogwood tree and smoked until he just had to find out how things were going. Then he jammed his cigar into a fork of the tree and rushed back inside. He never said anything about retrieving his cigar, so for all I know, it could still be there. Joshua’s parents knew they would be on a roller coaster ride from the moment he arrived. I looked normal. There were no prenatal tests in the 60’s, not even a way to tell if the unborn child was a boy or a girl. Only my mother’s intuition led her to notice that something wasn’t exactly right, and she consulted a pediatrician. The pediatrician that they had used for my older brother was out of town so they talked to the New Guy. The New Guy realized he was looking at a heart problem but wasn’t sure of the details, so he sent my parents and me to the BIG HOSPITAL 200 miles away. The Doctors at the BIG HOSPITAL figured out that I had Tricuspid Atresia… and stopped. They had never successfully treated a Tricuspid before, so they gave my folks the diagnosis and told them to take me home and enjoy the time I had. I was not long for this world. New Guy hit the roof. BIG HOSPITAL may not be able to do anything, but he knew of places that would at least try. He found one, and to make a long story short, I was a patient of New Guy until I was 20 years old. The “new” had worn off by then, but he’s one of only two doctors to really understand what is going on inside of me – him and my current Cardiologist. I still see him around town every so often! By contrast, Joshua was pegged as a Cardiac Kid long ago, while he was still being knit together in his mother’s womb. The moment he was born he was handed off to a skilled care unit. Their only job is to keep him stable until it is time for his repair. And while we thought 200 miles was quite a way to travel to a hospital, that’s no longer true. 200 miles is a short trip. We’ve literally come a long way. More bloodwork today, and a doctor’s appointment later this week. As I have said before, I don’t just have a doctor, I have a medical team! They really come in handy until something unusual happens. Then it seem that every last one of them wants to schedule a follow-up appointment! I have seen my primary care doctor (his stand-in, actually, as this past week was his vacation) and my newest doctor, an Orthopedic specialist. I’ve been in contact with my Cardiologist’s office by e-mail and checked my pacemaker by telephone. When I fell I landed on that section of my abdomen so I scheduled a pacemaker check to see if there had been any damage – thankfully it is responding just fine. So I think I have checked in with just about everyone! I’m ready for the wrist to be better, for all these bruises to heal, and to put this behind me. I haven’t walked in two weeks, and patience is not always one of my virtues! British Prime Minister Winston Churchill would often write the phrase Action This Day when he wanted something done NOW, and eventually he started using large red stickers with the phrase. I’m like that, too – I haven’t walked since my fall (July 22) and I can feel it. I want my knees to get better right now so I can walk instead of waddle. They’re coming along, slowly…. not nearly as fast as I would like! Exercise of any kind does my weak heart good, but right now I’m on the sidelines and I hate it! Churchill also did most of his work at a stand-up desk, perhaps I need one of those, too!